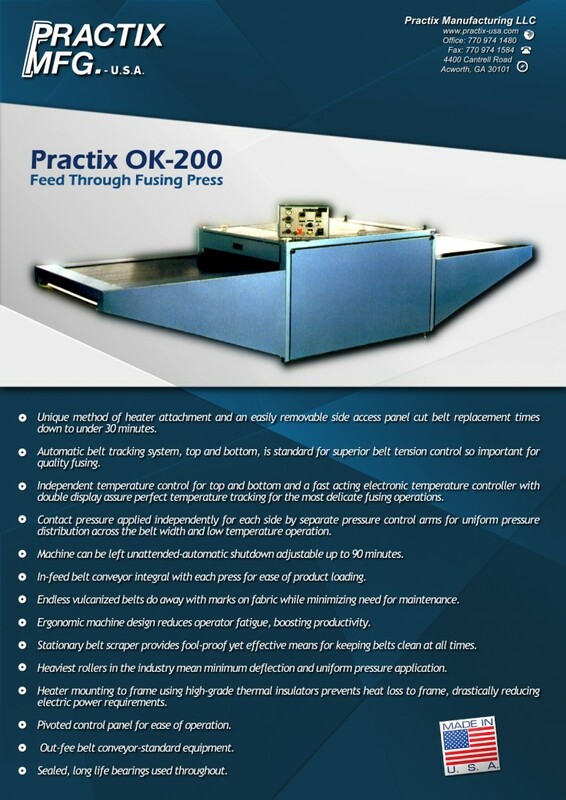 Engineered and manufactured right here in the U.S., the Practix OK-200 Line features several sizes of ruggedly built fusing presses, combining quality construction and high productivity wit competitive pricing and unequalled after-sales support. 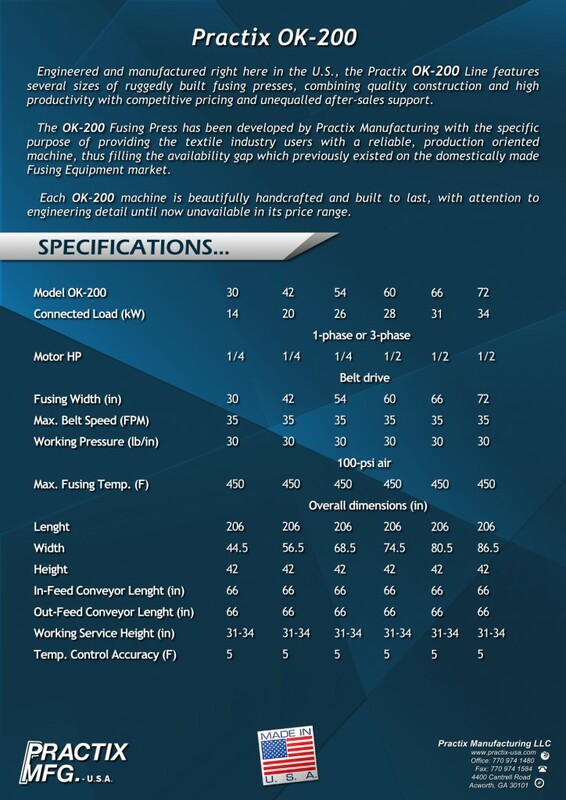 The OK-200 Fusing Press has been developed by Practix Manufacturing with the specific purpose of providing the textile industry users with a reliable, production oriented machine, thus filling the availability gap which previously existed on the domestically mad Fusing Equipment market. Each OK-200 machine is beautifully handcrafted and built to last, with attention to engineering detail until now unavailable in its price range. Unique method of heater attachment and an easily removable side access panel cut belt replacement times down to under 30 minutes. Automatic belt tracking system, top and bottom, is standard for superior belt tension control so important for quality fusing. Independent temperature control for top and bottom and a fast acting electronic temperature controller with double display assure perfect temperature tracking for the most delicate fusing operations. Contact pressure applied independently for each side by separate pressure control arms for uniform pressure distribution across the belt width and low temperature operation. Machine can be left unattended-automatic shutdown adjustable up to 90 minutes. In-feed belt conveyor integral with each press for ease of product loading. Endless vulcanized belts do away with marks on fabric while minimizing need for maintenance. Ergonomic machine design reduces operator fatigue, boosting productivity. Stationary belt scraper provides fool-proof yet effective means for keeping belts clean at all times. Heaviest rollers in the industry mean minimum deflection and uniform pressure application. Heater mounting to frame using high-grade thermal insulators prevents heat loss to frame, drastically reducing electric power requirements. Pivoted control panel for ease of operation. Sealed, long life bearings used throughout.